I had a stellar weekend. A friend asked me to accompany her to Ladies Rock Camp here in town. It’s a weekend day camp for women, and the tuition helps provide scholarships for Rock ‘n’ Roll Camp for Girls summer and after school programs. I had fun and did a good thing at the same time! Campers have their choice of guitar, bass, drums, keyboards, or vocals. No experience necessary. On Friday you form a band with a variety of instrumentalists depending on what kind of music you’re interested in playing. There are two sessions of instrument instruction, a couple workshops, and the rest of the time is devoted to band practice. You write a song with your band, and perform it on Sunday. Quick work! I wanted to do something that I might use in real life, so I opted for vocals. I wanted to improve my singing and presentation skills. Becky wanted to see if there was an inner rocker hiding behind her mandolin (they put her with the guitar class). She was in my band, and we liked her sound so much that she had emergency surgery for her mandolin on Saturday morning and had a pickup installed so we could amp her! I’ve written a couple songs before, and I’ve had bits of lyrics running through my head for a song called “How Can I Miss You If You Won’t Go Away.” We took it and ran with it. Here’s our band: She Let Her Sassy Out. 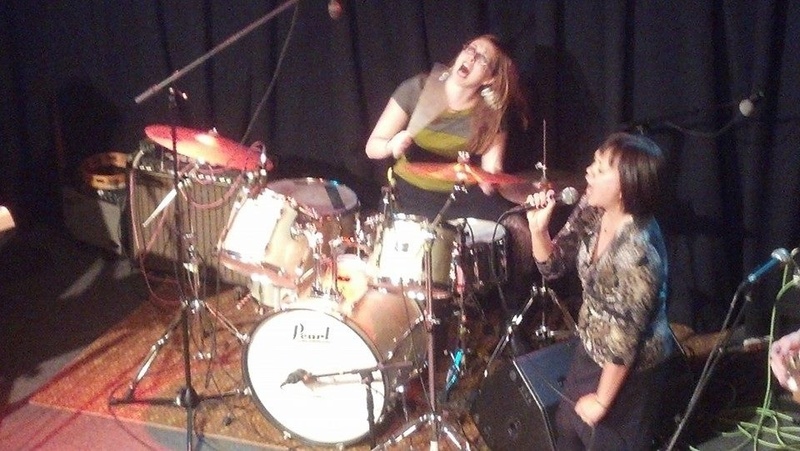 Hannah on keyboards, Bobbi Sue on drums, Becky on electric mandolin, and me on vocals. 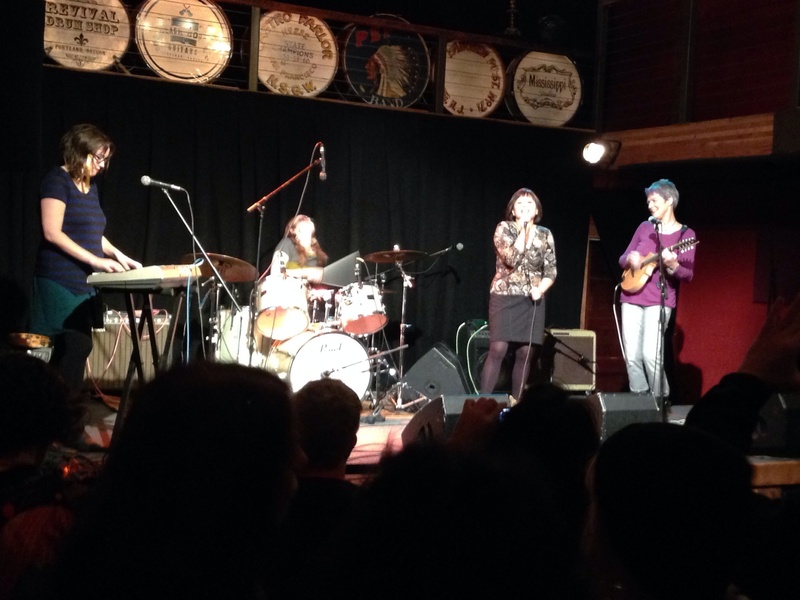 The camp showcase was at Mississippi Studios, a local music venue. It was so cool having professional lighting, sound, and roadies. It is amazing how much you can accomplish over one intense weekend; all the bands sounded great! We had fun with “How Can I Miss You” (mp3 link here, if you’re interested). I may have to do this again next year…it’s for a good cause! It was hard to go back to real life on Monday. But I’m back to knitting this little sweater for Lorajean’s baby girl, due in 8 days. Almost done! I have two design projects to work on, and I’m teaching at Twisted on Saturday. 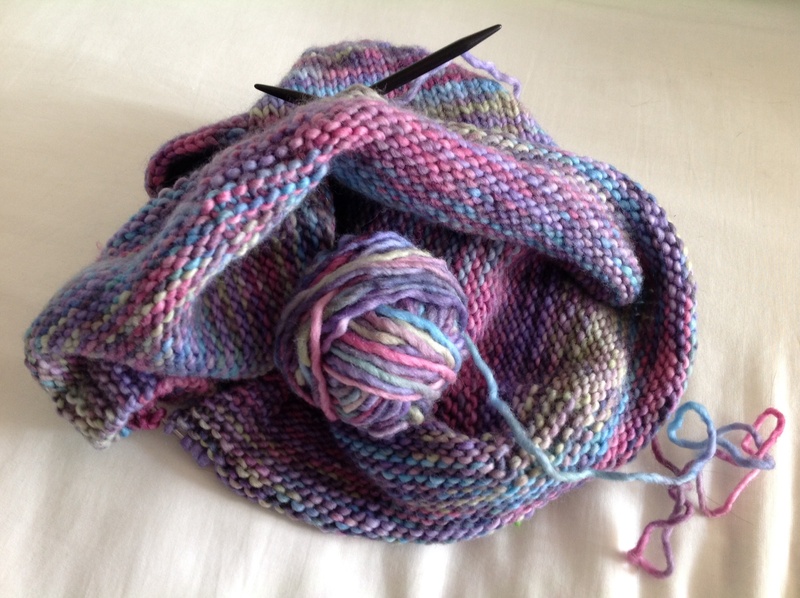 We’re doing entrelac in the round (my Athena Cowl), and blocking. Both classes are full, so we’ll probably do both of them again soon. This entry was posted in Knit, music and tagged girls rock camp, ladies rock camp, music, Rock 'n' Roll Camp, rock 'n' roll camp for girls. Bookmark the permalink. What a great way to spend the weekend! Rock on. Thanks for the replay. I was blessed with some amazing photo play opportunity with a 2-year-old…and many knitting/crochet crunch. Have a great day, Michele. Sounds like a lot of fun – I’d be interested in attending next year! It’s a fun weekend, and you really get to go outside your comfort zone! Hope to see you there next time. Glad you liked it! It was fun. And…it’s not about my DH. Honest!